Enjoy 5 star luxury at our lavish spa and hotel in the Suffolk countryside, close to Cambridge and the Cambridgeshire area. Designed with pure tranquillity in mind, our highly acclaimed spa boasts impressive facilities for a day of ultimate relaxation. With features including our stunning outdoor rooftop hot tub and hydrotherapy pool, there is plenty to do and lots of relaxing to be had! Our spacious hydrotherapy pool includes five unique water experiences with water jets to ease any tension in your neck and shoulders. We also have a rasul for cleansing mud treatments, with private steam rooms for two with a selection of body muds to apply which detox and cleanse the body. 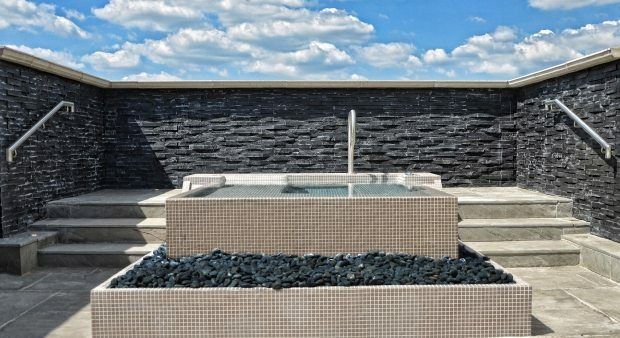 As well as thermal areas and dedicated relaxation rooms, our spa has everything you could need. We have various days, breaks and packages available at our luxury spa, just outside of the Cambridgeshire area. From relaxation days, to our popular champagne spa day and spa days for two. There’s something for everyone! As well as our range of impressive facilities, our spa also boasts a luxurious lounge for a spot of lunch! If you can tear yourself away from the sauna, enjoy a range of light lunches and sharing platters. As well as a range of drinks, including champagne, wine and smoothies available throughout the day. Or how about making a weekend of it? Our hotel breaks and packages are ideal for those wanting true downtime and a weekend of pure bliss. Our spa also boasts a 4 star hotel with chic and contemporary bedrooms, complimentary fitness centre and rosette winning restaurant. The perfect location to escape the stresses of daily life and enjoy quality time with friends and loved ones. View our full range of hotel breaks and spa packages to see what’s on offer. Our hotel and spa is the perfect base for a night at the races or for exploring nearby Cambridge!